April's First Friday Lancaster will be busy with multiple events involving the PCA&D community. 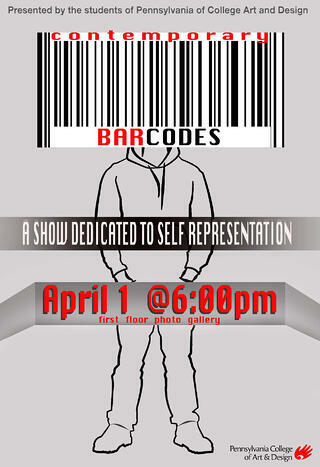 Contemporary Barcodes: A show dedicated to self representation, will open First Friday, April 1, from 6-8 p.m. in the Photography Department Hallway Gallery at Pennsylvania College of Art & Design, 204 N Prince Street, Lancaster. The show consists of self-portraits by students from all of the majors, as well as foundation students, and is curated by Trayton Pinson, senior photography major. The Contemporary Barcodes exhibition will continue until the end of the semester. “The Emperor’s New Clothes,” where 12 students from PCA&D will be visually interpreting the classic Hans Christian Andersen tale (Community Room of King, 106 W King Street, 5 – 8 p.m.). The students are enrolled in the Media, Form, and Concept class taught by Davis Moss, PCA&D fine art faculty member. “A Look Into Small Town vs. City Living” by PCA&D illustration senior Lexus Harris. First Friday, April 1, 5:30-8:00 pm, at the Lancaster Public Library, 125 N Duke St, Lancaster PA. Her exhibit contrasts watercolor portraits of individuals from Lititz and the City of Lancaster. “WE’RE IN THIS TOGETHER: the work behind the work," featuring seven PCA&D alumni, will be shown at the Sunshine Art+Design, 104 West King Street Lancaster. A First Friday Reception will be held April 1, from 6 to 9 pm. Matt Allyn Chapman, ’08, was the guest curator for this show. Grand Opening/Open House at PCA&D faculty member's Megan Zettlemoyer's new letterpress studio on First Friday April 1, 5-9 p.m. , in The WashHouse Art & Commerce Center, 420 West Grant Street, across the alley from Thistlefinch.